The Victorian novel, “Lorna Doone – a Romance of Exmoor”, is generally assumed to be a work of fiction, set in a stunning location on the borders of Devon and Somerset and against the turbulent historical backdrop of the Monmouth Rebellion of 1685. Yet some believe that the author, R D Blackmore, drew upon illusive tales of real people who once lived, fought, loved and died in his beloved Exmoor. The book is seen through the eyes of honest young farmer John Ridd, and tells the story of his love for the beautiful and mysterious Lorna, whom everyone believes to be the granddaughter of Sir Ensor Doone. The Doones are a vicious, brutal, gang who terrorise the neighbourhood, robbing, murdering and extorting. John – or ‘Jan’ in West Country dialect – after many adventures eventually defeats the Doones and wins his bride. But the menacing and jealous Carver Doone is still on the loose. Seeking revenge, he makes his way to Oare church on the happy couple’s wedding day – and shoots Lorna. “It is impossible for any who have not loved as I have to conceive my joy and pride, when after ring and all was done, and the parson had blessed us, Lorna turned to look at me with her glances of subtle fun subdued by this great act. Her eyes, which none on earth may ever equal, or compare with, told me such a depth of comfort, yet awaiting further commune, that I was almost amazed, thoroughly as I knew them. Darling eyes, the sweetest eyes, the loveliest, the most loving eyes – the sound of a shot rang through the church and those eyes were filled with death. 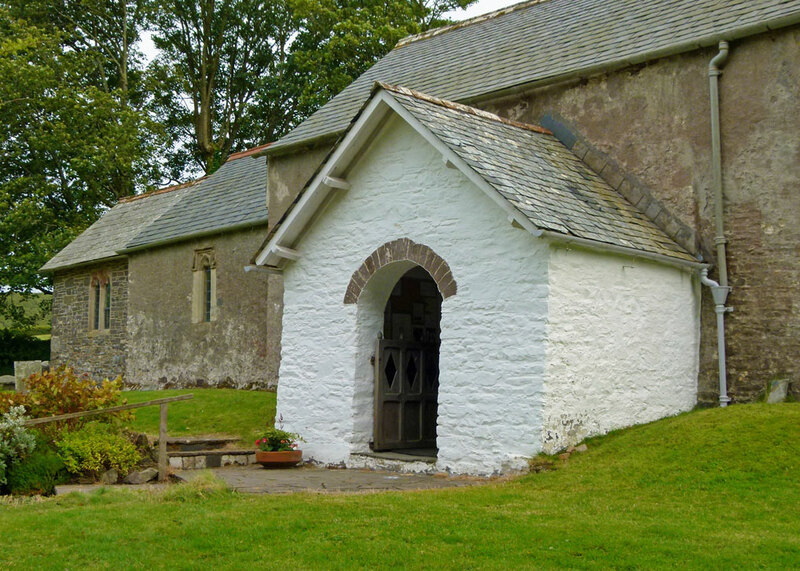 So you can’t possibly visit Exmoor without going to St Mary’s in Oare, where this terrible and dramatic act is supposed to have happened (in the book). We were staying with our friend Paul, who generously undertook all the driving as we rattled along slender lanes at the bottom of deep combes, a couple of miles inland somewhere between Bagworthy and Countisbury. Fortunately, there was no other traffic. A red doe (a deer, a female deer…) leapt in front of us and scrabbled in panic up the wooded slope on the other side of the track. Stupidly, we’d left the decent map behind and I was trying to see where we were on an inadequate small-scale road atlas, whilst simultaneously playfully head-butting Paul’s roof. Then we were on it, an ancient diminutive stone affair on a bank above a sunken lane with a distinctive, whitewashed, porch. House martins had built their nest inside the ridge of the porch roof and looked down nervously as we creaked open the door. 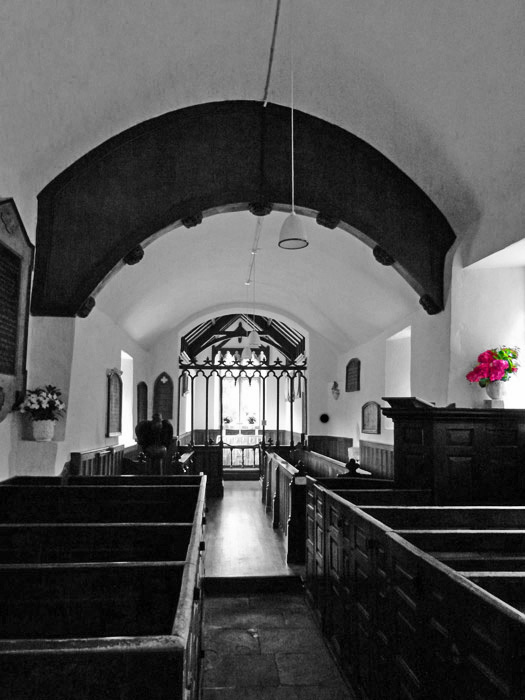 It is a peaceful, simple, church, lined with box pews. The nave is believed to be 15th century, the tower and the chancel added in the 19th century. Tiny now, at the time in which the novel was set it would have been even smaller, perhaps only accommodating a dozen or so worshippers. 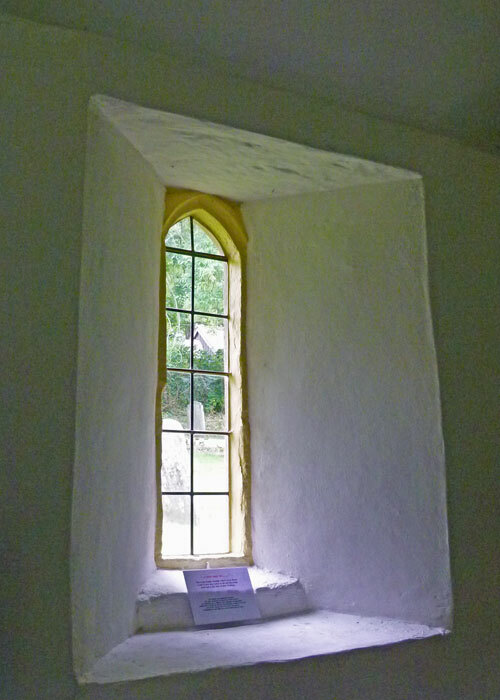 The window through which Carver Doone is meant to have fired his gun would have been unglazed in the 17th century. There’s a memorial to Richard Doddridge Blackmore (1825-1900) on the north wall; he is buried in Teddington. Outside, the setting was overcast, but just wonderful – and totally silent. When we got home, I took down an old copy of “Lorna Doone”. It was amongst a collection of books that have been in the family for years, a lovely, small, red-bound thing with gilt lettering on the spine, published by Collins and with illustrations by Wilmot Lunt. There’s no date in it; I should imagine it was printed sometime in the 1920s or 30s, and doubt whether it had been opened for at least half a century. Intriguingly, there’s an unknown woman’s name written in the front – perhaps someone’s old girlfriend, long gone. 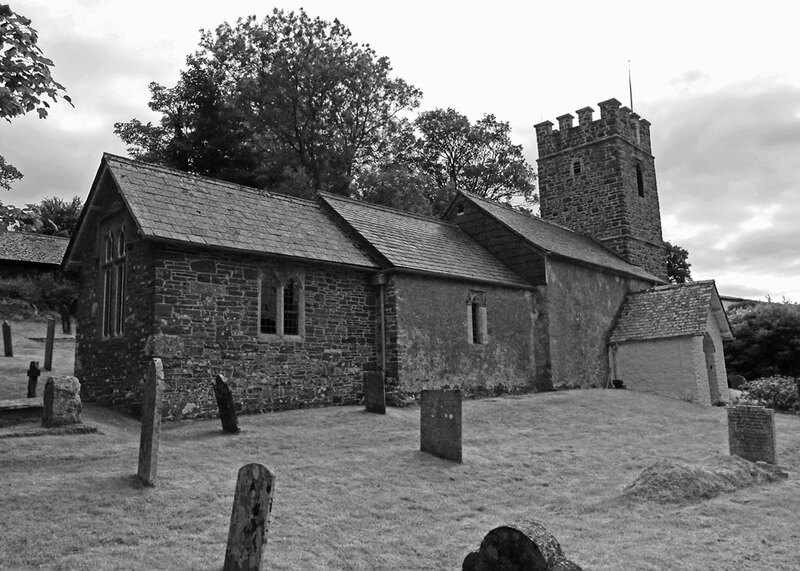 In any event, not having ever read the full version, I thought I better had – particularly having visited Oare church. Besides, I wanted to know what happened – don’t you? 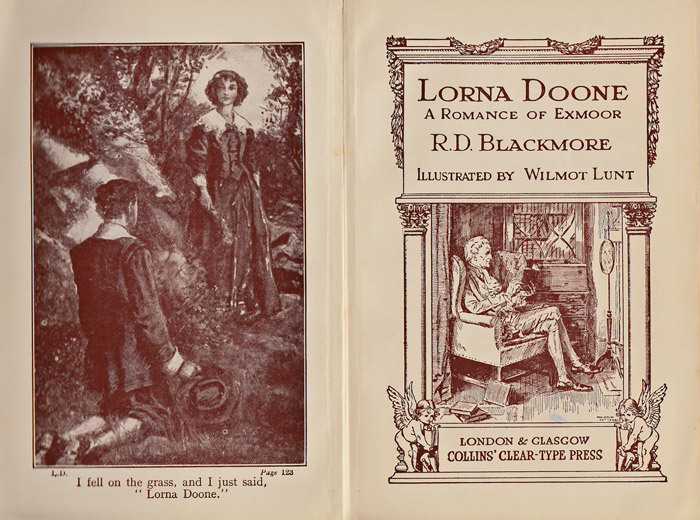 My copy of “Lorna Doone – a Romance of Exmoor” is charming. But it is also 640 pages of some of the most tortuous Victorian prose I have ever come across; RD Blackmore was certainly no Bernard Cornwell. I found myself getting incredibly frustrated on occasions with our hero, Jan Ridd, who not only seemed incapable of saying anything in one word when he had twenty at his disposal and, in so doing, in a round about kind of way, without wishing to prevaricate or obfuscate, and certainly not to overly use subordinate clauses, if you get my drift, often took a heck of a long time to get to the point. It also saddens me to say that Jan, for all his undoubted virtues, could sometimes be ponderously thick. That said, it is a great story – full of adventure, romance (of course), not without humour – and deservedly a classic. Though it’s been both filmed and televised numerous times, I don’t understand why there hasn’t been a more memorable or successful movie version. David Lean could have done something with it, but now I’m thinking it’s more Spielberg – or possibly Ron Howard or Tom Hanks; definitely not Tarantino. Will you contact them, or shall I? For the rest of you – Jan tracked wicked Carver Doone down to the moors where they fought. Carver was beat and then got accidentally sucked into the black bog, never to be seen again. Exhausted, Jan made his way home to find that, miraculously, Lorna had survived. And everyone lived happily ever after. Fabulous shots! I remember reading the book as a child. Ah yes, Lorna Doone! 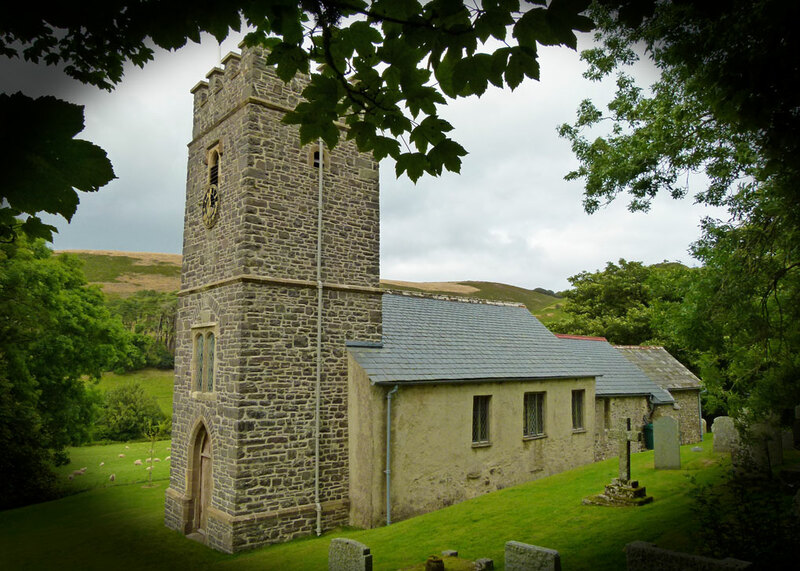 Having been born and brought up in North Devon close to the Exmoor border, I was very aware of the story of Lorna and Jan. I’ve been many times to Oare church, sweet little place. BBC TV made the story into a serial for Children’s television back in the 1960s I think. I seem to remember there was a production on Sunday nights, a very long time ago. Thanks for dropping in! I’ve never read it. Thanks for saving me the trouble of ploughing through the tortuous Victorian prose. Looks a gorgeous little church. Too far away for me to plan to visit though. Everything was lovely until the end. What the heck is the yellow head with the hole in it? I love your adventures! Thank you. Thanks – and thanks for dropping by! 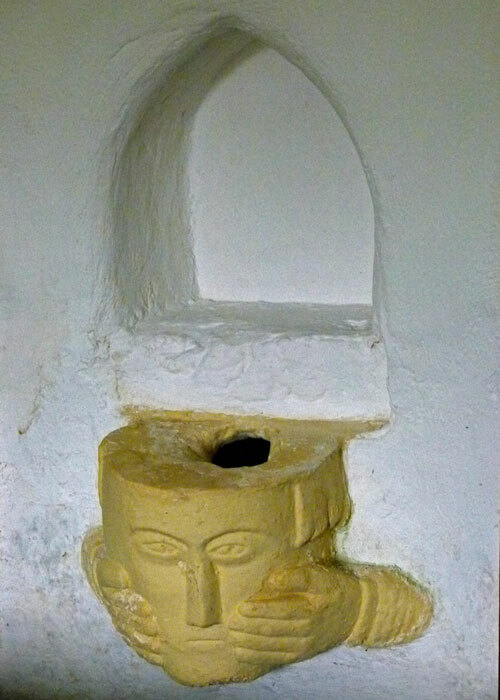 It’s an unusual medieval piscina – used for washing vessels. If you hover your cursor over a photo in A Bit About Britain, a caption should appear – but it doesn’t work with some browsers and mobile devices. Yes, I’m wondering how it got its name? I have actually been there and have a photo of the statue! It was a lovely day and this was so long ago, but I remember the town and walking around taking photos, especially the one of Lorna. What a great post, lots of history, I loved it. That is interesting to visit the setting of a novel or movie or TV series. It is a lovely ancient church. I agree with the classics being frustrating to read. We lived for 18 months not far from the Devon/Somerset border at Bradford-on-Tone a village near Wellington and Taunton. We never got to Oare, which is a pity as I love Lorna Doone – the book – I have never been quite happy with any of the adaptations. Jan/John is a bit thick I do agree! I like the piscina! I am interested by your Collins Classic edition and have seen them about in second-hand bookshops etc. I have an ancient copy of a book (John Halifax Gentleman by Mrs Craik) published by The British India Publishing Company, Calcutta which has the same illustration on the frontispiece of the gentleman sitting reading by the fire. The company must have been bought up by Collins or was a subsidiary of theirs I presume. Wow, I knew nothing about “Lorna”! Very interesting indeed. Heard of it of course but never read the book or even seen a film or TV production of it, which is strange as the BBC love adapting the classics. Maybe it just didn’t appear on my radar although I enjoyed exploring Exmoor itself in my younger days when I spent some time in Devon. Like the church though which I did manage to miss back then being more interested in the nightlife around Ilfracombe, Minehead, Torbay and Plymouth. I’ve never read it, but I can imagine how such places could inspire the writing process. The only book by Blackmore I have read so far is “Mary Anerley – A Yorkshire Tale”, and I really enjoyed that one. I know what you mean about the inability (or unwillingness) of saying something in one word when twenty can be used… But “Mary Anerley” wasn’t as long as “Lorna”. If you are interested in my review of “Mary Anerley”, it is here. Anyway, “Lorna” really is some story! 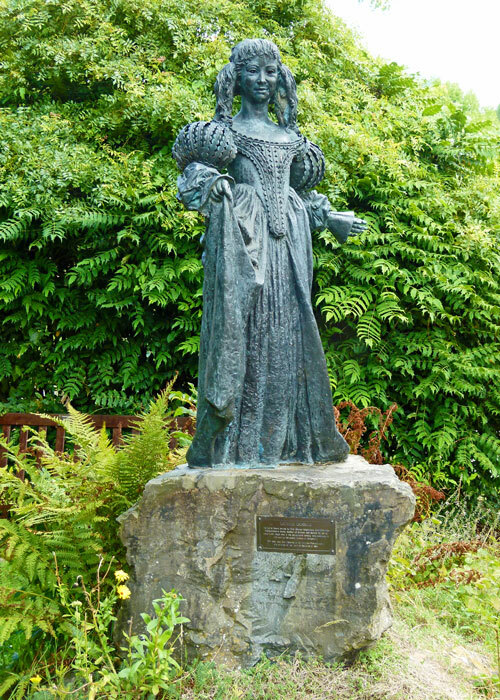 I hadn’t heard of ‘Mary Anerley’ until you mentioned it – but it sounds like a great tale! Did you know Lorna Doones are cookies in the USA? Hi Kay – yes, I’d heard about the cookies – I wonder where the name came from?